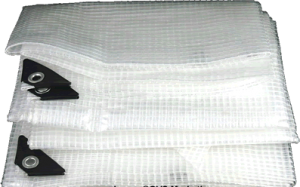 Clear or transparent white-string tarps are made of heavy-duty polyethylene. Each tarp is waterproof, treated to prevent rot and UV protected. Dense 12x14 mesh (weave) count, 12mil thickness, 6oz. per sq. yard (1200 Denier) weight make these tarps heavy-duty and long lasting. The edges and corners are reinforced. Heavy-duty rust resistant aluminum grommets are spaced every 18" along all four sides. Clear white-string tarps contain a strong threaded interior throughout the fabric to prevent tearing. Use clear tarps for greenhouses and plant protection from the frost. 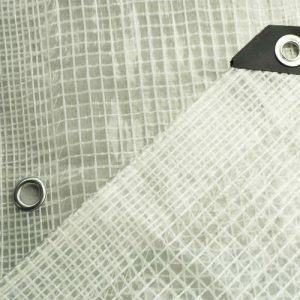 Use clear tarps when covering leaks in windows or roofing. Clear tarps are great for covering animal pens and shelters to allow light in. Events such as parties, concerts or sports.